Relax in style with this reclining sofa. A plush bustle back and cushioned footrest keep you in complete comfort. Accent stitching contributes to the reclining sofa's sleek contemporary design. Distance required between recliner and wall 3.00"
The Kilzer DuraBlend® Contemporary Reclining Sofa by Signature Design by Ashley at Michael's Furniture Warehouse in the San Fernando & Los Angeles area. Product availability may vary. Contact us for the most current availability on this product. Contemporary style and comfort go hand in hand with this upholstery collection. Pillow arms and shaped bustle backs feature accent stitching for a livable casual contemporary feel. 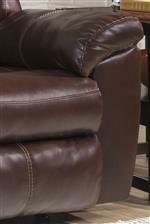 The DuraBlend® bonded leather upholstery in the seating areas is matching with polyurethane everywhere else for the look of leather at an affordable price. The Kilzer DuraBlend® collection is a great option if you are looking for Contemporary furniture in the San Fernando & Los Angeles area. Browse other items in the Kilzer DuraBlend® collection from Michael's Furniture Warehouse in the San Fernando & Los Angeles area.